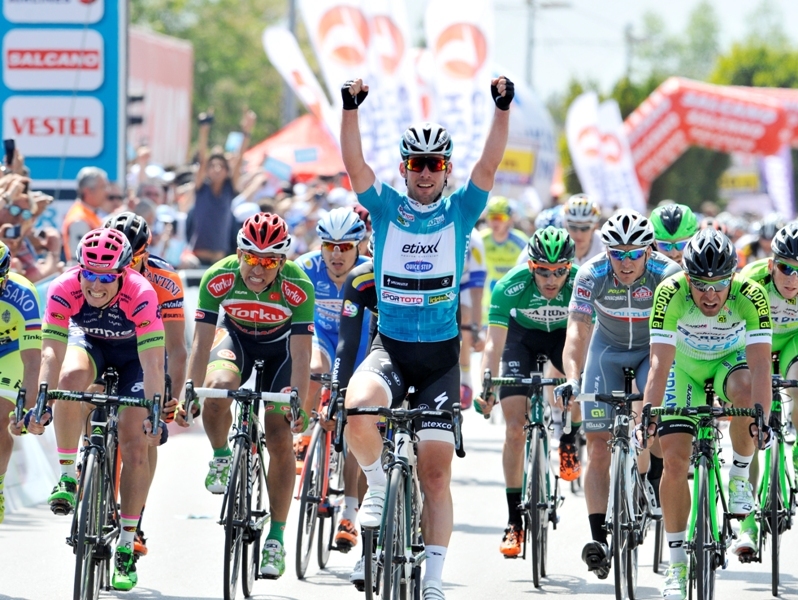 Antalya, 27 April 2015 – Mark Cavendish (Etixx – Quick Step) made it two stage wins out of two at the 2015 Presidential Cycling Tour of Turkey today. At the end of Stage 2, Alanya – Antalya (182 km), he finished comfortably ahead of Sacha Modolo (Lampre – Merida) and Nicola Ruffoni (Bardiani CSF). Cavendish retained the race leader’s Turquoise Jersey, and reinforced his lead in the Green Jersey points competition. The stage started in intense sunshine and still conditions. After 23km of racing, three riders attacked: Lluis Mas (Caja Rural – RGA, dossard 96), Adrien Niyonshuti (MTN – Qhubeka, 135), Frederik Veuchelen (Wanty – Groupe Gobert, 197). They were soon joined by Kevin De Mesmaeker (Team Novo Nordisk, 162) and Federico Zurlo (UnitedHealthcare, 188), who was wearing the Red Jersey of the mountains leader, but declared yesterday a greater interest in the Beauties of Turkey sprint competition, which he also led. These five formed the breakaway of the day. 3. De Mesmaeker 1 pt. This left Mas and Zurlo equal on 8 points in the Beauties of Turkey sprint competition. The maximum lead of the five attackers was 5m 37s. This put Zurlo equal on points with yesterday’s stage winner Cavendish. 19 km before the finish, Cavendish’s main lead-out man Mark Renshaw had a front-wheel puncture, which added tension to the very fast tun in to the finish. Within 4 km he had regained the back of the peloton The breakaway was caught with 12 kilometres still to ride. Stage finish: “Renshaw had a puncture inside the final 20 km, and I finished the stage with a slow puncture. With five kilometres to go, my wheel went away from me. I had a look back. It wasn’t flat, but it was spongey. The train was already working, so I thought, ‘Oh God, if I stop, Renshaw will have done all that work to get back for nothing, so I thought I’d give it a crack. [Modolo] came past us early, so Renshaw had to go a lot earlier that yesterday. He was really trying to hang on, and by the time I came past, he was slowing down. On the Gulf of Antalya, which has 53 km (33 mi) of coast against the backdrop of the western Taurus Mountains. Until the 1960s there was no road connection and the district was accessible only by boat. Quiet until the early 1980s, today Kemer and its coastal villages play an important part in tourism in Turkey. Kemer’s 320 berth marina is an important winter berth for live-aboard sailors from the USA and Europe. Kemer was called Eski Köy (Old Village) until a 23 km (14 mi) long stone wall was built in 1916 – 1917 to channel the mountain stream water and protect the town from flooding. The name Kemer refers to those walls. Annual events include boat racing, the World Rally Championship, the Turkish Offshore Championship, the Turkish Motocross Championship, the Phaselis Art Festival and Kemer Carnival. km 9 – 156.3 km to go – junction for Phaselis (36° 31′ 25″ N, 30° 33′ 08″ E): ancient Greek and Roman city between the Bey Mountains and the forests of Olympos National Park. Founded in 700 BC, its location on an isthmus separating two harbours made it the most important harbour city of eastern Lycia and an important centre of commerce between Greece, Asia, Egypt, and Phoenicia. Phaselis was renowned for its roses, from which the essence was extracted. Captured first by Persians, then by Alexander the Great, it lay in Egyptian hands until188 BC when the peace treaty of Apamea, between the Roman Republic and the Seleucid Empire, handed it to the Kingdom of Rhodes. After 160 BC it was absorbed into the Lycian confederacy under Roman rule. In 42 BC Brutus had the city linked to Rome. In the 3rd century AD, the harbour fell under the threat of pirates once again. It began to lose importance, suffering further losses at the hands of Arab ships, until totally impoverished in the 11th century. When the Seljuqs began to concentrate on Alanya and Antalya as ports, Phaselis ceased to be a port of any note. There was a temple of Athene at Phaselis, where the lance of Achilles was exhibited. It was the birthplace of Theodectes (c. 380 – c. 340 BCE) ), a Greek rhetorician and tragic poet, a pupil of Plato and an intimate friend of Aristotle. He spent most of his life at Athens, and was buried on the sacred road to Eleusis. The inhabitants of Phaselis honored him with a statue, which was decorated with garlands by Alexander the Great on his way to the East. km 26.7 – 138.6 km to go – Olimpos Ancient City Road km to go – The Tahtalı Dağı (36° 25′ 54″ N, 30° 27′ 21″ E), also known as Lycian Olympus, is a mountain near Kemer, a seaside resort on the Turkish Riviera near Antalya. It is part of the Beydağları Coastal National Park. Visitors can ascend the summit with the Olympos Aerial Tram. It is the site of dozens of small fires which burn constantly from vents in the rocks on the side of the mountain. Directly below the fires are the ruins of the temple of Hephaistos, the Greek god who was associated with fire through his role as the blacksmith to the gods. To see the fires and the ruins, visitors must first go to the entrance at the foot of the mountain. The site is at the top of a one kilometre climb. This is basically a rock stairway and is easily managed. Most people visit at night, when the fires are at their most spectacular. It has been suggested that the fires are the inspiration for the fire-breathing Chimera in Homer’s Illiad. The site was identified as the ancient Mount Chimaera by Sir Francis Beaufort in 1811. OLYMPOS BEACH (36° 25′ 10.53″ N, 30° 29′ 6.81” E) km 29: on the banks of Tahtalı mountain. km 40 – 125.3 km to go – junction leading to Pirates Bay (Korsan Koyu) and Cape Gelidonya (Gelidonya Burnu or Taşlık Burnu, 36° 11′ 36″ N, 30° 24′ 11″ E): a cape or headland on the Teke Peninsula, located on south coast of Anatolia between the Gulf of Antalya and the Bay of Finike. Known to the Romansas Promontorium Sacrum (Holy Promontory). The Taurus Mountains end there. South of the cape is a group of five islands. The cape is the site of a late Bronze Age shipwreck (c. 1200 BC), at a depth of about 27m, on irregular rocky bottom. It was located in 1954, and the excavation began in 1960. Among the finds were Mycenaean pottery, scrape copper, copper and tin ingots, and merchant weights. km 50 – 115.3 km to go – Rhodiapolis (36°23′13″N 30°15′56″E): founded by colonists from Rhodes. In the Roman period, famous for being the home of the millionaire philanthropist Opramoas. A monument was constructed in his memory close to the city’s theater. On the monument’s walls is the longest inscription in Lycia, commemorating his benefactions and the numerous honours bestowed on him. According to these, Opramoas donated approximately 500,000 denarii to twenty-eight cities in Lycia to repair the damage caused by an earthquake between 140 and 143 AD. He also funded the construction of two temples at Rhodiapolis. Heraclitus was another famous resident, known for his oratory and knowledge of medicine. The city was discovered in 1842. The remains of an aqueduct, a small theatre, a temple of Asclepius, sarcophagi, and churches are still visible on the site. In 2011 a Lycian cemetery complex was discovered, dating from approximately 300 BC. km 67.3 – 98.0 km to go – Finike (36°18′N 30°09′E) For centuries Finike, then named Phoenicus, was a trading port, the main port of Limyra, the capital city of Lycia. Phoenicus was said to have been founded by Phoenicians in the 5th Century BC, and thus named after its founders. The port of Finike is now a yacht marina, and has a small fishing fleet. The coast is rich in marine life, including sea turtles, and fish, including local specialities red porgy Sparidae and grouper (Epinephelus); other fish found along the coast include leerfish (Carangidae) and the more widespread Mediterranean varieties such as bluefish, sea bream, sea bass, with swordfish, sardines and others found further out to sea. The beaches of Finike are an important nesting ground for rare loggerhead turtles, and the rocky parts of the coast are used by the rare Mediterranean Monk Seal. André Greipel won stages at Finike during the 2010 and 2011 TURs. km 99.0 – 66.3 km to go – Beauties of Turkey Prime: Arykanda (km 99, 36°30′50″N 30°03′36″E): an ancient Lycian city, built on five large terraces ascending a mountain slope. the oldest remains and finds from the city date from the 6th or 5th century BCE. The site is being excavated and restored by an Ankara University team. The acropolis houses Hellenistic and older remains of the site which include the temple of Helios, shops and houses. The lower city houses most of the Roman remains, including a bath complex on the lowest terrace, still virtually intact in its sequence of arches, next to the gymnasium; the remains of Tyche Temple; a theatre, in excellent condition, built during the 1st century BCE. In the 2nd century odeon, a stone that was discovered that bears a portrait of the Emperor Hadrian. It is now in Antalya Archaeological Museum. A stadium (running track) from the Hellenistic period, has seating on one side. It is smaller than a usual stadium, measuring 106 m. long and 17 m. wide. km 131.0 – 34.3 km – Elmalı. 6 km east of Elmalı lies the village of Bayındır, where the Elmalı Treasures (Elmalı Hazinesi) were found. An important find of antique treasure, they comprise 1,900 silver coins including 1,100 from Lydia and 14 extremely rare Athens Decadrachme, each worth US$600,000 and said to be the world’s most valuable treasure trove. They were discovered during an illegal excavation in 1984 in Bayındır village, Elmalı and smuggled to the U.S. Their retrieval from the Boston Museum of Fine Arts through the efforts of the journalist Özgen Acar and the Turkish government made the headlines in late 1990s. Today, the coins are on exhibit in Elmalı Museum. Near Bayındır stand several tumuli side by side. Artifacts dating back to the 7th century BC were unearthed during the excavations. Now on display in a special section of the Antalya Museum, these findings represent a cross-section of life during that era, including a statuette in pure silver and two ivory bears. km 165.3 – 0.0 km to go – Göğübeli Finish (CAT 1). A stunning natural amphitheatre bearing comparison with the site of the stage finish on the Zoncolan in the Giro d’Italia. Elmalı (literally ‘Apple Town’) is a district as well as a town in Antalya Province. It lies about 35 km inland, at the head of a long upland valley at an altitude that varies between 1050 to 1150 meters above sea level in Elmalı town centre. The exact founding date of Elmali, which is located within the borders of ancient Lycia, is unknown. Excavations to the east at Karatas near the village of Semahoyuk, and to the west in the village of Beyler indicate that the area has been inhabited seen the Bronze Age. There are several tumuli in nearby villages. Excavations show that the area has been continuously inhabited from the Bronze Age right up to the present time. The items unearthed in the excavations are exhibited in the Antalya Museum.